Two-part polyester resin keeps fiberglass in place on vertical surfaces during layups, and remains tacky between coats for maximum adhesion when laminating. No sanding between coats. Excellent for saturating fiberglass fabrics. Each Kit order includes: 1 QT size plastic mixing pot, 1 10" wooden stir stick, and 1 pair of large, powder-free latex gloves. Tacky is good when you’re doing fiberglass layups and need to keep building layers without having them harden up on you. 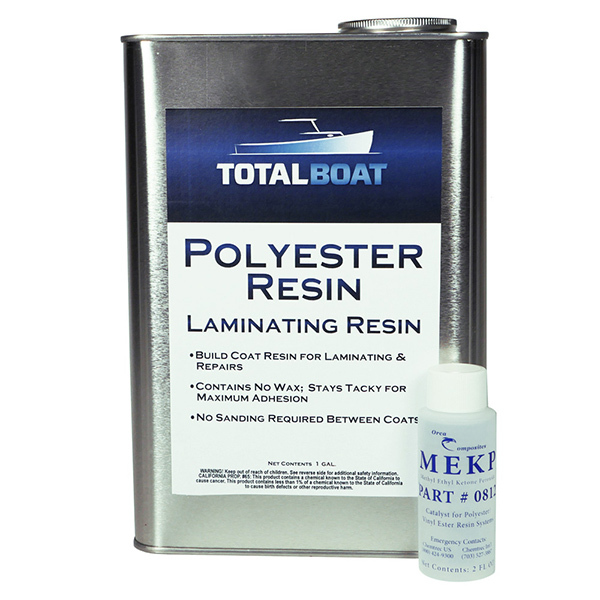 TotalBoat Polyester Laminating Resin will not cure on its own in direct contact with air. It contains no wax to prevent creation of an oxygen barrier that would cause it to cure, so it stays tacky and won’t sag while you’re building up layers. Its viscosity is ideal for wetting out fiberglass mat and cloth. Apply a final coat of TotalBoat Polyester Finishing Resin (which does contain wax) that cures to a hard, tack-free finish ready for sanding, painting, or gelcoating. The following table indicates approximate gel times @ 70°F. Adjust the hardener level to slow down or speed up gel time. Cooler temperatures may require a higher percentage of hardener than warmer temperature conditions.